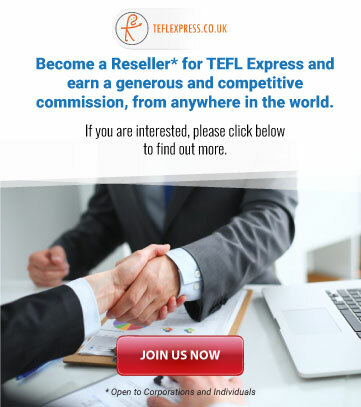 This website is owned and operated by TEFL Express Limited. All intellectual property rights, including copyright, in the content displayed on this website belong to TEFL Express Limited or its licensors, and all rights are hereby reserved. You may only use the content of this website for your personal non-commercial use. You agree not to download, copy, reproduce, modify, store, redistribute or commercially exploit in any way any part of the content of this website without the prior written permission of TEFL Express Limited. Neither we nor any third parties provide any warranty or guarantee as to the accuracy, completeness, suitability, timeliness or performance, of the information and materials found or offered on this website for any particular purpose. You acknowledge that such information and materials may contain inaccuracies or errors and we expressly exclude liability for any such inaccuracies or errors to the fullest extent permitted by law. Your use of any information or materials on this website is entirely at your own risk, for which we shall not be liable. It shall be your own responsibility to ensure that any products, services or information available on or through this website meet your particular requirements. This website contains material which is owned by or licensed to us. This material includes, but is not limited to, the design, layout, appearance and graphics. Reproduction of this material is prohibited other than in accordance with the copyright notice, which forms part of these terms and conditions. You may not create any link to this website from other websites without prior written consent from TEFL Express. All courses must be paid for in full prior to the course commencing with the exception of our internship programme. A deposit is required to secure a place on our internship programme, usually signing up for the TEFL 120 hour online course is accepted as the deposit. Deposits for the internship programme are non-refundable. The balance of the internship fee must be paid no later than 1 month before the first day of the internship starting date. Should the balance not reach us on time you will automatically be placed on a reserve list and risk losing your place if someone pays in full before you. There will be no right to a refund of your deposit. more than 1 months notice, no penalty. less than 1months notice, you will forfeit your original deposit which must be paid again. less than 2 weeks - 0% refund. All online courses, content, material, tasks and certificates, are delivered online through the TEFL Express virtual campus. All online courses are valid for 75 days from date of activation. If you need more time or want to take a slower pace during your course, you can purchase a study extension for your course inside the TEFL Express Virtual Campus. All your work will be saved even if the course expires. Extension options range from 2 weeks to 1 year. If you fail a unit in your online course you will see a "Re-sit" button instead of the "Check Result" button at the bottom of every task in the failed unit. When you fail a unit, you only need to re-sit tasks within the failed unit until you achieve pass rate. There is one free re-sit per task and you'll be charged a "re-sit" fee only if and when you re-sit the same task twice. 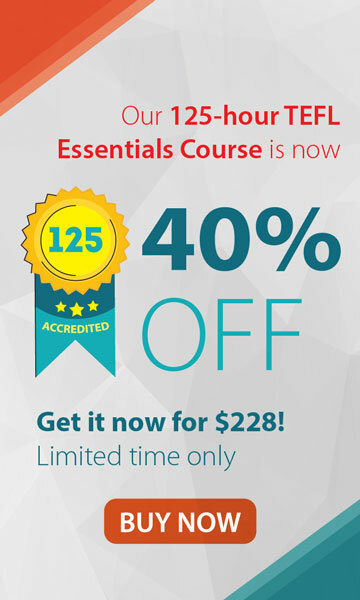 To successful complete your course and gain your TEFL certificate you must pass all course units with a score of 55% or more and all course pages must be saved. If for any reason you are not satisfied with the online course you have purchased, you are entitled to a full refund within 14 days of buying directly on our site only if the certificate is not issued. If you have a certificate, the refund can't be issued, even if it's within the 14 day period.If you are using a voucher issued by a third party please contact the third party for their refund policy. If you do cancel the course, any access to course materials will be removed from your log-in. Any gift vouchers issued will be cancelled. Any fees paid for study time extensions are non-refundable, regardless of at which point during your course make this purchase. Downloadable resources are non-refundable purchases due to their instantaneous nature. 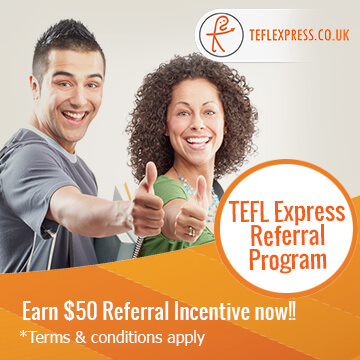 There is no refund option applied to the purchase of a TEFL Express downloadable resource. TEFL Express e-book content is available to view and download instantly on purchase and as such cannot to be returned for a refund. We aim to answer your voice mails, emails, livechat and TEFL Advice messages within 24-48 hours. Please allow more time during weekends and public holidays. Should you avail of our tutor support and contact the academic team, they'll aim to answer your query within 24-48 hours, depending on the nature and type of assistance required. We will endeavour to reply to your request within 1 working day (Monday to Friday) and resolve any complaints within 14 working days. When ordering your TEFL Express hard copy certificate from your online account you will have the choice of standard post, recorded or airmail delivery. You'll be asked to confirm your name and postal address for your certificate during this process. If you choose to pay via PayPal ensure that the shipping address saved within your account matches where you'd like to have your hard copy certificate mailed to. If you supply an incorrect shipping address you will be charged for a duplicate certificate. When ordering your hard copy certificate you will also be asked to confirm how you would like your name to appear on your certificate. TEFL Express is not responsible for any errors in the spelling or presentation of your name on hard copy certificates. Should you require a replacement certificate due to an error regarding your name, you will be charged for a replacement certificate. From June 2014 all certificates will include the ACCREDITAT logo following full accreditation approval. You will also be entitled to obtain a separate certificate from ACCREDITAT if you wish, following course completion. In certain course packages an ACCREDITAT certificate may be included in the course fee. If you are unsure, contact us for confirmation. Please Note: If you registered for your TEFL course prior to June 2014, your TEFL certificate will not include the logo of ACCREDITAT.